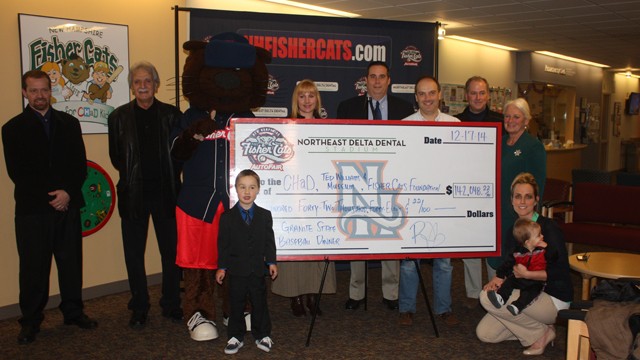 In the offices of the Children's Hospital at Dartmouth-Hitchcock in Manchester today, the New Hampshire Fisher Cats announced the proceeds from the 2014 Granite State Baseball Dinner, presented by Northeast Delta Dental. Through sponsorship donations, ticket sales, silent and live auctions, and raffle ticket sales, $142,049 was donated to benefit CHaD, the Ted Williams Foundation, and the Fisher Cats Foundation at the annual gala on Nov. 22. "It is with great pride that our organization gets to host this event and present this check every year," said Art Solomon, Fisher Cats owner and Chairman of the Fisher Cats Foundation board. "The work of our Foundation is near and dear to my heart, but this event in particular means so much because of the impact it is able to make. We are so thankful for the support of all of the sponsors and fans who continue to make this event so meaningful each year." "Each year during the holiday season we are able to make this announcement, and it means so much to our team and our staff," said Fisher Cats President & General Manager Rick Brenner. "It takes a lot of dedicated people donating a lot of their time and resources to make this event successful, but this announcement and presentation today, and the work of these great charities, is the reward for those efforts. We know these funds will assist these groups with the important and necessary services they provide our communities." Since the Fisher Cats became involved with the dinner in 2007, it has generated more than $1.28 million for the three charitable groups. CHaD has received more than $558,000 to support its mission to provide world-class care to families and kids throughout the northeast. The Fisher Cats Foundation has used a similar amount to help fund more than $3.5 million in monetary and in-kind donations since its inception in 2006. The Ted Williams Foundation has been gifted with nearly $173,000 to continue its efforts to promote the history and tradition of baseball while also providing outreach to community groups and scholarships to high school students. The 2014 dinner featured a unique panel of celebrity guests, including New Hampshire legend and Cy Young Award winner Chris Carpenter. Red Sox star Brock Holt co-headlined the event alongside Carpenter, as well as several popular former Red Sox, including Luis Tiant, Rich Gedman, and Lou Merloni. Other guests with major league connections included Cy Young winners Denny McLain and Dwight 'Doc' Gooden, All-Stars Bob Stanley and Gary Matthews, and Claudia Williams, author and daughter of Hall-of-Famer Ted Williams. Several Granite Staters also featured at the head table, including minor league infielder Michael Fransoso of Portsmouth and pitcher Derrick Sylvester of Franklin. Miss New Hampshire Megan Coolely was joined by 2012 Paralympic gold medalist Victoria Arlen of Exeter. The dinner tradition will continue in 2015 on Saturday, Nov. 21. The Fisher Cats will open the 2015 season on Thursday, April 9, at Northeast Delta Dental Stadium against the New Britain Rock Cats (Colorado Rockies). Full and Half-Season Tickets are currently on sale, and feature a variety of benefits and experiences. To learn more, stop by the box office at Northeast Delta Dental Stadium, call (603) 641-2005, or visit www.nhfishercats.com.